As of 2016, our otoneurological practice in Chicago had 33 patients with PM in our database, accumulated over 26 years, of whom 20 were men, and 13 were female. The average age when they presented to our clinic was 57. Almost all of our patients had the non-essential type (i.e. they had neurological lesions including inferior olivary hypertrophy, or cerebellar atrophy). While we have stopped putting video's of the palate of every patient, we have these for most patients as well as video's of their eyes in our files. Illustrative case histories are found below. 58749 Stroke post angiography 69 Vertical and torsional pendular. CTT lesion. Case 5511. A man in his 60's began to develop disturbance of his speech. His health was otherwise good, except for atrial fibrillation. Neurological examination documented palatal myoclonus. Over several years, he gradually developed imbalance, and a subtle torsional pendular nystagmus was eventually documented. 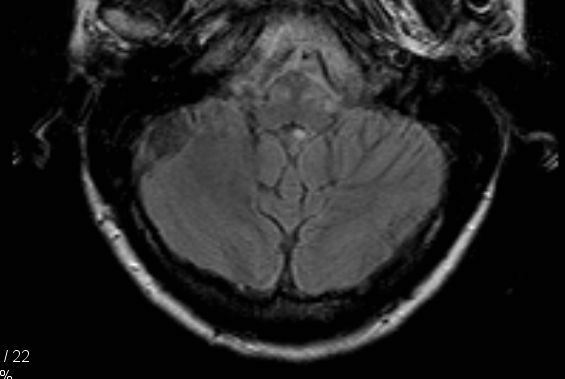 MRI scanning, initially read as normal, documented hypertrophy of both inferior olivary nuclei on review by a neuroradiologist familiar with OPM. One of his cardiac medications was stopped because of concern that it might be the cause of his PM. His PM and nystagmus disappeared several years after his cardiac antiarrhythmic was stopped. Case 6792. A man in his 70's presented for an evaluation of ataxia. His health was also affected by atrial fibrillation and a monoclonal gammopathy, neither of which were seriously disturbing to him. He was taking amiodarone for his atrial fibrillation. Examination documented a torsional pendular nystagmus and palatal myoclonus. Case 2808. 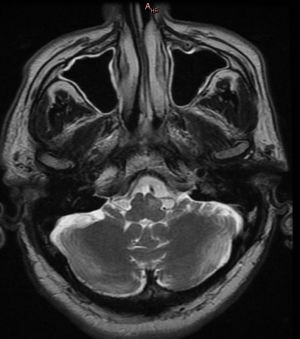 A woman had a large CP angle menigioma removed via a transmastoid approach. Post-operatively she was deaf on the side of the tumor and had facial weakness. Two to three weeks later palatal myoclonus ensued. Multiple MRI scans showed no superior olivary hypertrophy. No nystagmus was observed using very sensitive recording methods. 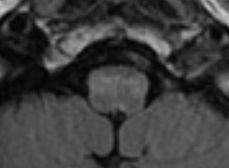 Comment: The mechanism of PM in this patient seems unlikely to be related to a lesion in the Guillain Mollaret triangle as MRI shows no lesion or olivary hypertrophy. Case 5374. A 76 year old gentleman presented with a 3 year history of unsteadiness, without falls. He also has a "chirping" tinnitus, and each time that he hears the chirp, the horizon "jumps" slightly in the left eye. A thorough workup was performed including VNG (dx BPPV), ECochG (high on left),VEMP (normal), CDP (ataxia), MRI (scattered UBO), TCD (normal), Carotid Doppler (normal), SSEP (normal), EMG (mild sensory), B12 (normal). Video ENG in the office documented weak downbeating nystagmus without any change between eyes. However, inspection of the palate revealed a very clear palatal myoclonus. The tinnitus could not be heard by the examiner (i.e. it is not stapedius myoclonus). 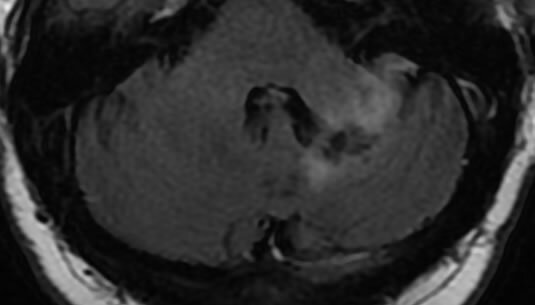 Comment: This patient's ataxia, in hindsight, is part of the OPM syndrome. It is probable that a more sensitive method of comparing the two eyes would show that there is a discongugate deviation of the eyes during each "chirp". Chirping tinnitus and monocular visual disturbance should suggest to the clinician that OPM may be the cause. This woman was first diagnosed with palatal myoclonus when she was 40. The palatal movement was accompanied by a loud clicking sound. MRI scan initially was read as being normal. On a second, higher resolution scan, the superior cerebellar artery (SCA) was seen to be indenting the root entry zone of the Vth nerve on the left side. This is thus not a central PM case, but a peripheral type. This man was first diagnosed with palatal myoclonus when 61. The presenting symptoms were ataxia and orthostatic hypotension. The MRI was initially read as being normal, but on review, there is increased flair in the IO area of the medulla. 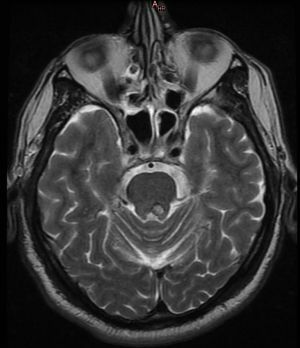 In this case, PM was first diagnosed about 20 years after a brainstem hemorrhage. On an MRI done 9 years post stroke, a lesion can be seen in the right dorsal midbrain as well as increased flair is seen in the inferior olive. The radiologists missed the increased signal in the IO. This man suffered a cerebellar stroke when he was 45, due to a basilar artery occlusion. MRI showed substantial cerebellar infarcts, brainstem infarcts, occipital infarct. On exam, there is obvious palatal myoclonus, and a subtle torsional nystagmus (see movie). 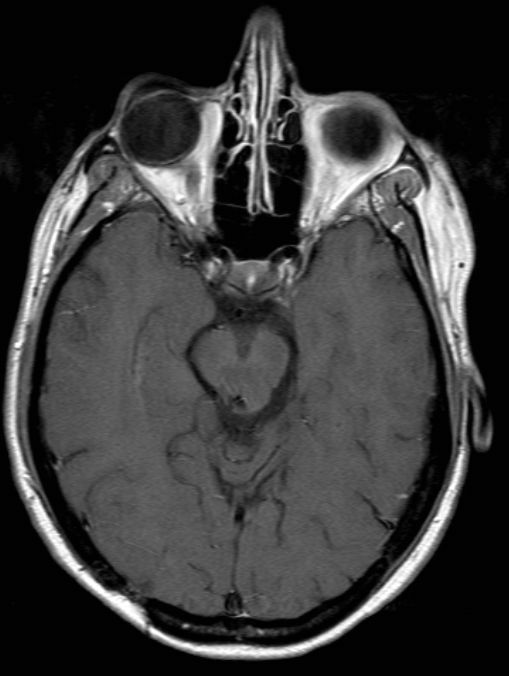 This case suggests that one can develop PM and nystagmus with a lesion of the red nucleus area. Multiple cerebellar infarcts in patient with OPM. His medulla (not shown) shows a subtle area of enhancement in the left inferior olive. 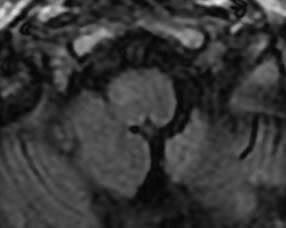 This man, in his 60's underwent diagnostic angiography to evaluate pulastile tinnitus. After the angiogram, there were was right sided weakness, presumed to be a complication of angiography. This recovered nearly completely after rehabilitation. About 3 years later, he developed imbalance and his voice changed to a more gravelly deeper sound. He was admitted to the hospital, and no diagnosis was made (evidently no one looked at his throat). In the clinic, a palatal myoclonus was easily seen. He also has nystagmus and ataxia. 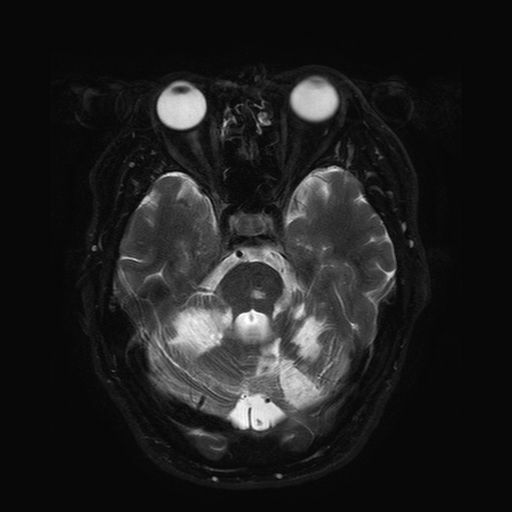 Comment: This localization suggests that a red nucleus area lesion can cause PM with nystagmus. On the recording above, an undulation of the vertical trace is seen, documenting a vertical pendular nystagmus. In his original MRI, done at the time of his angiogram, the olivary area was normal. In a followup MRI, done 3 years later (above), the olive has high signal on Flair. There was also a small area of enhancement in the left pons seen on followup MRI, but not seen at the time of his initial angiography. This lesion is presumably in the right central tegmental tract. Overall, the two MRI's show that the olive changed (presumably hypertrophied) on both sides as he was developing his oculo-palatal myoclonus. Comment: The mechanism here appears to be disconnection of the olive due to a unilateral central tegmental tract lesion. 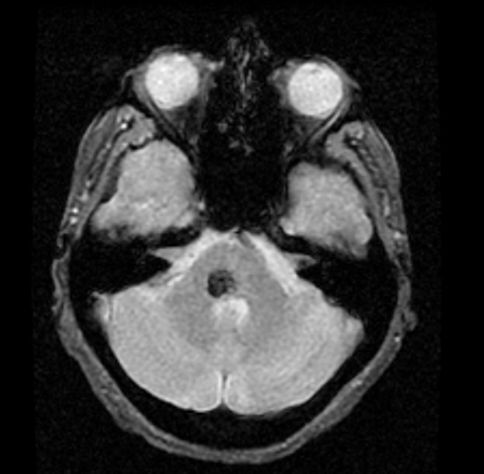 CTT lesions appear to be capable of causing both PM and nystagmus. 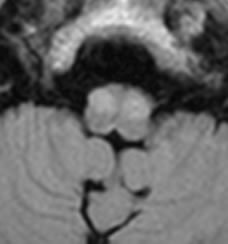 This patient had a cerebellar biopsy in the area of the dentate nucleus on the left side. After the biopsy, he developed a gravelly voice, and after some months delay, a palatal myoclonus was documented. He had no pendular nystagmus, but there was a weak alternating horizontal nystagmus. 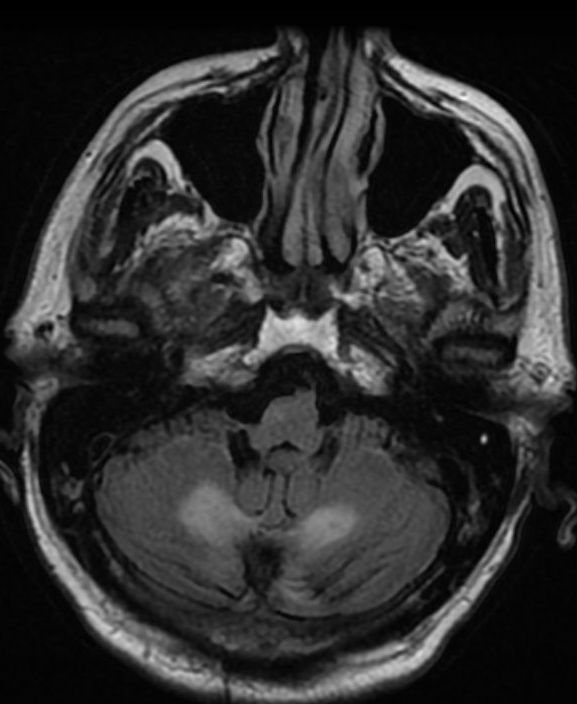 Comment: This case shows that one can have a clear lesion in the triangle of GM, without any nystagmus at all. This suggests that the generator for nystagmus might be the central tegmental tract of the red nucleus (the parts of the triangle not affected here).